Do you sometimes feel you are acting on autopilot? Do you ever enter a room and forget what you came for? Do you start to drive somewhere on the weekend and find yourself driving to work instead of your intended destination? Find out how to reduce these occurrences and aim for a healthy hippocampus which is associated with a lower risk of Alzheimer’s disease. 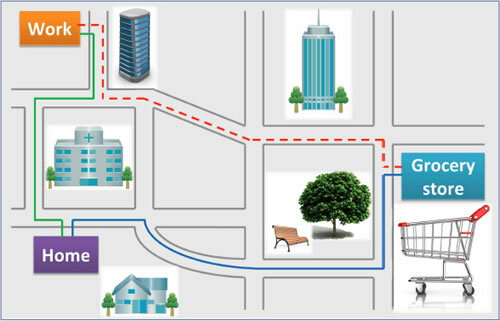 The spatial strategy, which relies on a part of the brain called the hippocampus, involves building relationships between environmental landmarks, such as buildings or parks, to form cognitive maps (mental maps) of an area. The hippocampus is also involved in memory for life events (in a given time and place) called episodic memory. The response strategy relies on a part of the brain called the caudate nucleus. It involves learning a route by performing a sequence of movements (e.g., turn right) from specific points (e.g., at the hospital). The response strategy does not involve building a cognitive map. 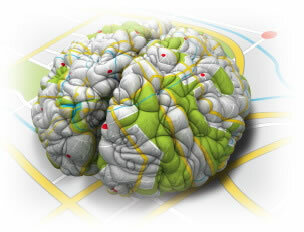 Cognitive maps allow us to derive shortcuts to go to a known destination coming from a new starting point! WHAT IS THE LINK BETWEEN STRATEGY, AGING, AND HEALTHY COGNITION? More activity in their hippocampus. Better scores on tests used to assess the risk of Alzheimer’s disease. The hippocampus is one of the first brain regions affected by Alzheimer’s disease. Some research studies show that pathology of the hippocampus precedes Alzheimer’s disease by several decades.Therefore, it is critical to form healthy habits in order to have a healthy hippocampus, prior to the onset of the disease. A larger hippocampus is associated with a reduced risk of numerous disorders such as Alzheimer’s disease, Post-Traumatic Stress Disorder, schizophrenia, and depression. People who use a spatial strategy are less likely to take drugs; they consume half the amount of alcohol and smoke fewer cigarettes. It’s about prevention, not cure! When you are in a hurry and do not have time to build cognitive maps. When you perform routine actions. When you feel stressed and fall back to autopilot. The response strategy can dominate over the spatial strategy and this can lead to the deterioration of the hippocampus and increase your risk of neurological and psychiatric disorders. However, response strategies can be efficient to help you create healthy habits. You can only use one strategy, spatial or response, at any given time, meaning you cannot use both simultaneously. Draw a bird’s eye view of your environment with landmarks. Take new streets and shortcuts to go somewhere while your GPS is off. Look for new types of exercises at vebosolutions.com. Be mindful of your habits. Incorporate new behaviors into your daily life. Follow the 4 pillars plan, which is based on scientific research, and remember that old habits die hard and new ones come with practice! This website contains health-related information. However, always consult your own physician or other qualified health professional if you have any questions or concerns about your health, diet or exercise regimen. VEBO SOLUTIONS cannot be held liable regarding any decision made by you based on the use of this website. Form a mental map of your environment. Encourage the use of a spatial strategy by learning relationships between points of interest in your environment. 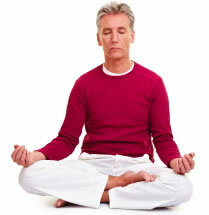 Meditate & do deep breathing exercises. Be mindful of your body in general. Walk the equivalent of 30 min/day, 5 times/week. Take dance lessons with friends & socialize. Mediterranean diet: eat plenty of vegetables, nuts, & legumes (lentils, split peas, chickpeas, beans). Include flax seeds & chia for Omega 3 oils. Limit your consumption of animal products to 4 days/week. Turn these pillars into habits by using repetition & reward yourself! English TV, Scientific Documentary: CBC Nature of things: Where Am I? Launch of VeboSolutions’ new website. 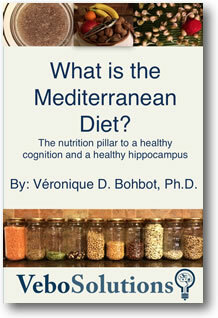 What is the Mediterranean Diet?, the nutrition pillar to a healthy cognition and a healthy hippocampus. And new findings to be shared!! and be the first to receive these notifications.